I’m not much of a shopper. You can find me at the mall about every 3-6 months, usually in search of something specific I need. Like taking our knives in to be sharpened at the cutlery store, for example, or getting new glasses. Not everyone would even classify these things as shopping. The Professor does a lot of the laundry, and recently she’s informed me that based on the state of what she’s seeing come through, I should buy some clothes. (Hard to believe, I know, that someone who sits around reading the dictionary doesn’t put a lot of energy into fashion.) She also mentioned that I should “feel free to buy a new coat” if I ran into one. I was thinking about the word parka, and wondered if perhaps it was Inuit. 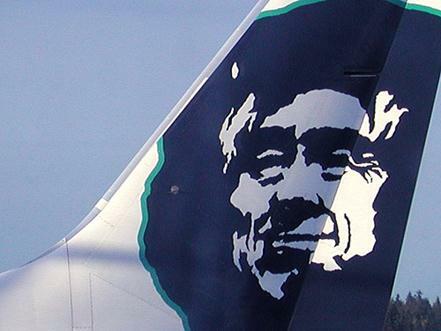 It fits the context of Arctic life—a prominent image of it in our part of the world is this tailfin iconography of Alaska Airlines. I was close to the right area of the globe, but we have to continue across the Bering Strait to find the origin of this word. Parka comes from Nenets, the language of an indigenous people found in Russia. And in fact, it is the only Nenets word that has made its way into English. I learned that Nenets is a member of the Samoyedic family of languages. This came as a surprise to me, as I had never heard of the Samoyedic family! If it’s cold and northern where it’s spoken, it might be Samoyedic. Among others, the Finnish language is called Suomi, and Lapps is Saami. The –d on Samoyed (an indicator of plurality) was misunderstood at some point by the Russians, so accounting for that you can see the similarities in Samoy, Suomi, and Saami. As usual, my curiosity about one word took me on a journey—this time, to a place I’d never been, both geographically and linguistically.